Western American Life Insurance Company is part of the Maximum Corporation based out of Richardson, Texas. As of 2009, the company’s assets, including its subsidiaries, exceeded $143 million. Compare online insurance quotes from active health insurance providers by entering your zip code into the toolbox now! Western American Life Insurance Company is licensed to underwrite insurance products in the state of Texas only. The company has been in existence since 1895 but was not incorporated until 1966. Western American Life Insurance only offers life insurance policies. Western American Life Insurance does not offer any medical insurance policies. Western American Life Insurance Company agents are all independent agents contracted to sell Western American Life Insurance Company products. You can find an agent closest to you by contacting the customer service department at (972) 699-2770. Company hours, directions and a map are all available on the Western American Life Insurance Company website. You can also contact any of the officers of the corporation by looking up their name under the “Contact Us” section of the website. However, for general information, you can call (972) 699-2770 or fax your information to (972) 699-2788. Western American Life Insurance Company is a small, family owned corporation. However, if you are interested in applying for a job with Western American Life Insurance Company through its parent company, you can view current job openings under the “Join Our Team” section on the website. You can also contact the human resource department or marketing department for career opportunities at (972) 699-2770. Forms for Western American Life Insurance Company can be downloaded on the website. The downloaded forms include claim forms, preneed forms, and policy maintenance forms. Western American Life Insurance Company offers different ways to have your premiums paid. First, payments can be established to be withdrawn from your bank account on a regular basis. Payments can also be made by mailing in your check to the company’s address. Payments can also be made annually, semi-annually, or quarterly. The necessary form to complete in order to make these changes can be downloaded on the company’s website. 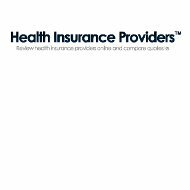 You can find active health insurance providers by entering your zip code now!